Last August Olivia and Mike chose to host their destination wedding on the beautiful Spanish island of Mallorca. They were joined by friends and family, and their young son Monty and baby Darcey. August is a popular time for weddings in Mallorca. Not only are you guaranteed sunshine and blue skies, but it’s also perfect for bridal couples, who are also parents, needing to take advantage of the school holidays. 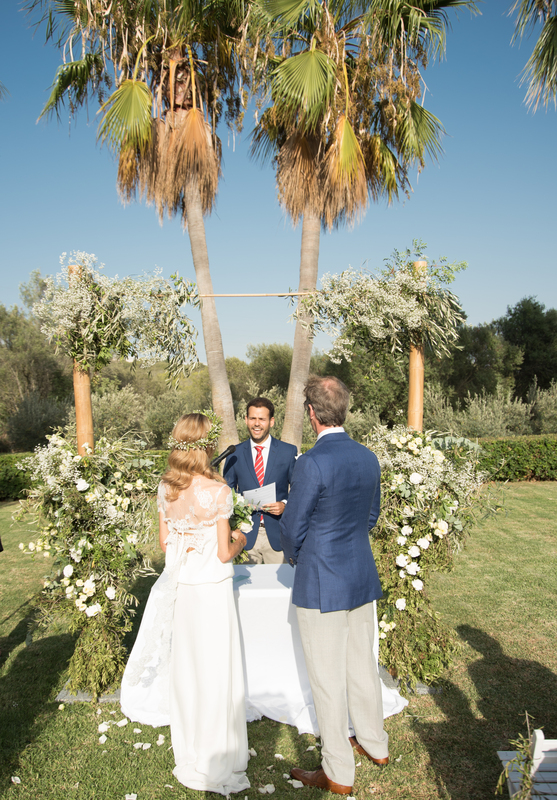 Olivia and Mike chose to marry at one of the most popular rustic wedding Fincas in Mallorca. The old stone farmhouse sits among a lush rural setting filled with lemon groves and vineyards. 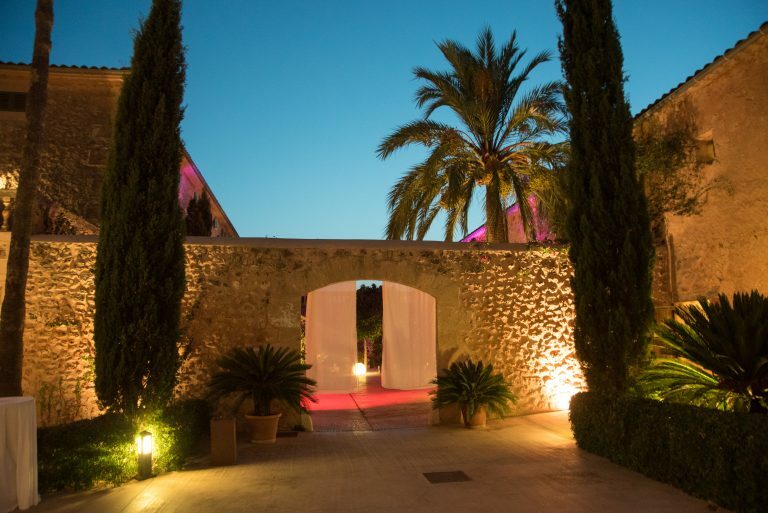 After having been abandoned for a number of years, the traditional Spanish estate was recently restored and rejuvenated into the breathtaking wedding and events venue it is today. This Spanish destination wedding venue is ideal for anyone wishing to have a bohemian-style wedding filled with natural touches. 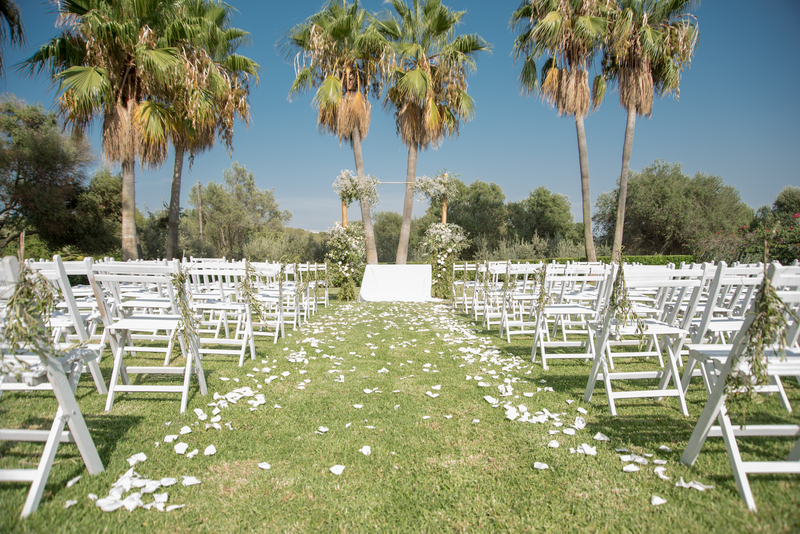 Olivia and Mike’s big day began by laying out white wooden chairs on the lawn surrounded by sweeping palms. They chose to hold the wedding ceremony overlooking the breathtaking vistas of mountains and farmland, and our team scattered white petals along the grassy aisle for a simple but effective finish. As guests arrived and were seated, they were accompanied by the melodic sounds of the Spanish guitar. To tie in with the relaxed setting and summer weather, Mike wore a blue blazer and pink tie, coupled with light trousers. Their toddler son, Monty, was also dressed in matching attire (it was very cute). Olivia was the picture of rustic charm, wearing an elegant white lace gown trimmed with antique lace and completed with a floral crown of bohemian gypsophila. Getting married when you have small children can be a challenge, so at Sunshine Weddings we do everything we can to make your day go as smoothly as possible. Unfortunately there are some things we can’t control…like your youngest catching chickenpox on the week of your wedding! Baby Darcey was a trooper though and, although a little under the weather, still managed to smile for the camera when our photographer took some beautiful family portraits. 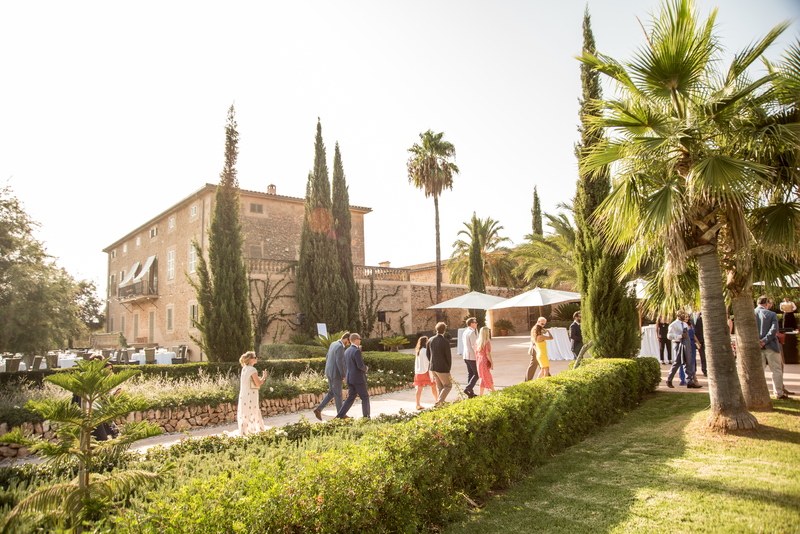 After the ceremony the guests were served drinks and the Spanish guitarist was joined by a drummer – a live ‘chill out’ soundtrack to the day, the perfect addition to the relaxed Iberian wedding. We arranged for sofas and seated to be positioned around the grounds of the rustic old farmhouse, so guests were able to sip their Cava and cold beers while enjoying local tapas canapés while taking in the majestic views. 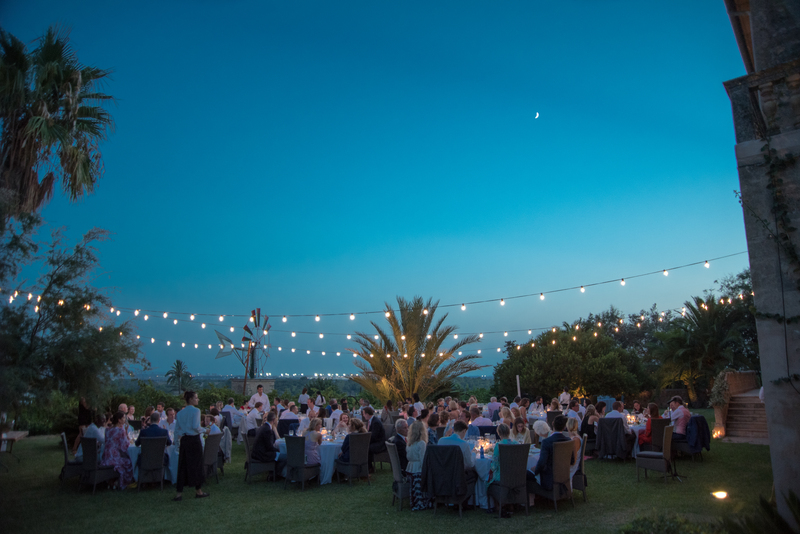 The wedding meal featuring a selection of favourite Spanish dishes was enjoyed on our luxury venue’s pretty terrace, in the shade of the finca’s ancient stone walls. In keeping with the rustic and laid-back wedding style, Olivia and Mike chose to forgo the standard wedding cake and first dance, and instead chose to have quality time partying away with the kids and their guests. In the evening the party got underway with our local resident DJ Ritchie. He was joined by the drummer and a sax player, ensuring a lot of fun was had by all on the dance floor. This bohemian summer wedding in Mallorca was the perfect rustic family celebration. Low key and simple but beautifully styled, everyone truly enjoyed the intimacy and unrushed ambience. We send lots of luck and love to Olivia, Mike and their lovely family – may married life together be as wonderful as your big day was.